It was Friday (28/06/2013). Oh, again it was raining. The sun was hidden by the dark cloudy sky. I went to the campus quite late at around 09.30 am. As usual this week, I went to bed again after the Subuh prayer. Arriving at the campus, the first place I visited first was the officer of my research group room. I wanted to collect my first year review result. The one that I was waiting for since my first year review presentation on Monday (24/06/2013). I was so nervous when she gave me the paper work. I was so afraid I was failed my first year review. I have been so worry waiting my result. In the UK education system, the first year review is a very determining point in PhD studies milestone. It is the point where a PhD student candidate will be confirmed to be a PhD student. The first year is probation period. I heard from my friends, the first year review was not an easy thing. Many students was failed in their first year review and need to be extended to three until six month for re-evaluation. Thus, I was worrying about my result. But, thanks God I got a good news. 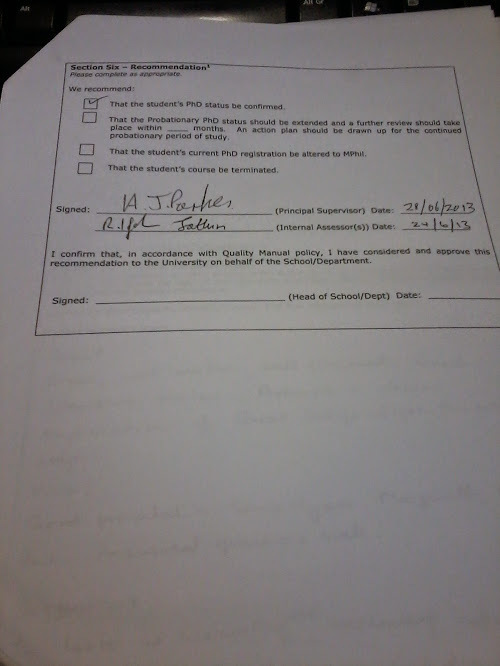 I was PASSED my first year review. I was so happy. Alhamdulillah. Thanks God. Thanks God. Thanks God. To be honest, I was not fully encouraged in my first year. I felt I was a half of mine. Yeah, the beginning is always never easy. I felt lonely, homesick, mellow, in almost everyday that distracted me from focusing on my studies. Even, in preparing my first year review report. I felt so lazy, I had never tried my best so far. I just simply tried to make a good enough effort yet frequently I just tried my worst effort. It was even worse, when I knew my supervisor was extremely busy during the days approaching the deadline. I got no feedback from my supervisors, yet I got very general idea feedback. However the show must go on. I did my first year review without good enough preparation. Only do’a from my friends and family supporting me. And, alhamdulilah, finally I was PASSED. 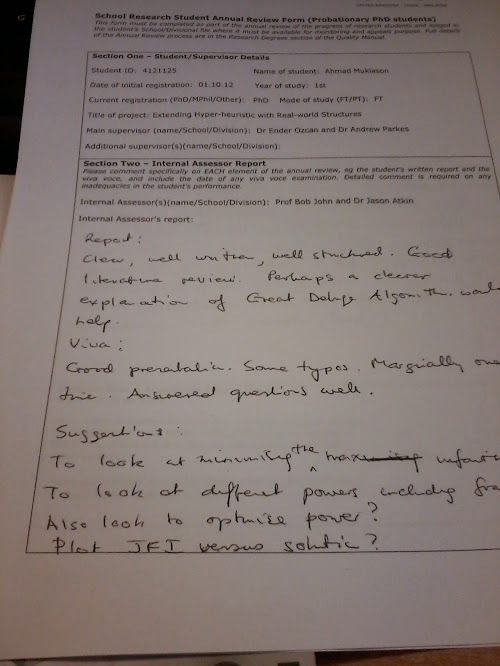 and I got not too bad comment form the examiners. At the end of the day, I was staying at George green library while writing this post before leaving home after making Maghrib Jamaah prayer at the Portlan Building. Thanks God again for today. Thanks God for your helping hand. I promised to my self to study harder in the future. I will try my very best, for the sake of you. Insya Allah. Please help me.